DA Form 705, Army Physical Fitness Test Scorecard is a form used to score and track the results of army physical fitness tests. It is also used to calculate whether a soldier passes the Army's physical fitness requirements. The form is published and used by TRADOC (the Training and Doctrine Command) and is supplied by the U.S. Army personnel division administering the physical fitness test. An up-to-date fillable form DA 705 can be downloaded from the United States Army website or down below. What is the Army APFT scorecard? Form DA 705 is a scoring and evaluation form used during army physical fitness tests. The form, often incorrectly referred to as the DD Form 705, contains individual information of the soldier taking the test and the results of the physical examination. The scorecard also includes a chart used to score the performance of soldiers during each part of the test. Personal information, such as the age group or gender will affect the score and its interpretation. Each test has its own box, which must be fully completed before submission. The form is handed to the scorer before each test event. Once the test is over and all results are calculated, copies of the form are given to the officers conducting the tests and to the soldiers who have taken the physical fitness test to keep. The most recent DA Form 705 revision was released in May 2010 and is actual and in use today. How to Fill the DA form 705? Start with filling in the basic identification info in the top box. This form only requires soldiers' name, age, gender, and unit. The same information must be reproduced on all additional pages in case the army physical fitness test is taken more than four times during the military career. The top line of the DA 705 must be filled with the soldier’s ID information, grade, age, and the date of the testing. Fill in the physical characteristics of the soldier taking the test: the height, weight, and body fat percentage. The next boxes are used to grade the separate tests event. A separate score must be kept for the push-ups, sit-ups, the two-mile run, and alternative aerobic event. 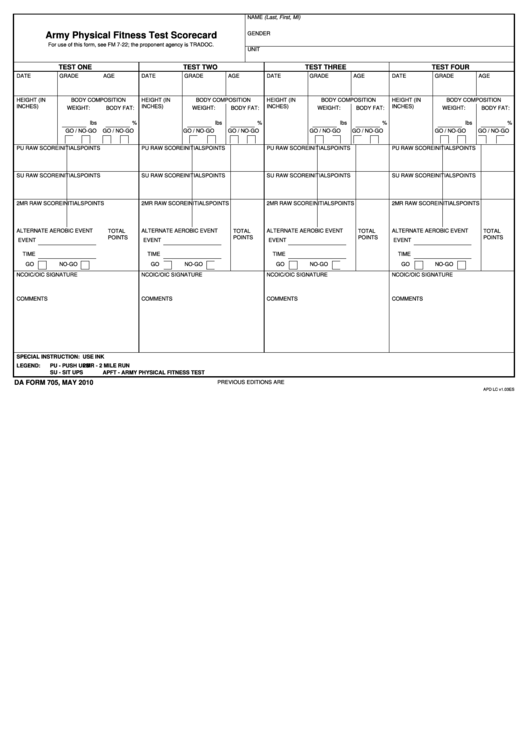 Use the army standards chart included in the DA 705 form to evaluate performance. This chart provides the proper scoring for each physical fitness test. Raw numbers must be recorded along with the points given for every activity. There are no numerical results to the alternative aerobic event - the scorer must tick GO or NO GO in the appropriate box. Finally, the supervising officer must fill in the overall results, provide additional comments if necessary, put the date and sign the form. Copies will be kept both by the officers conducting the test and the soldiers taking it. The Army physical test is a three-event test used to measure physical abilities and endurance. This test assesses physical strengths and weaknesses and cardio-respiratory fitness. The results of the test will give you and your commanders an indication of your state of fitness and will act as a guide in determining your physical training needs. Passing the test is a must to graduate boot camp and continue on to Advance Infantry Training. Test events include two minutes of push-ups, two minutes of sit-ups, and a timed 2-mile run. In cases when performing a run is impossible, an alternative aerobic event can be used. This includes an 800-Yard-Swim, a 6.2-Mile Stationary-Cycle Ergometer Test, a 6.2-Mile Bicycle Ride or a 2.5-Mile Walk Test. The order of events cannot be changed. After each event, the performance is evaluated and the result is recorded in the DA 705 form. Your age, gender, any repeat attempts or time elapsed for each event determines your score. The test is performed in normal workout gear. What Is the Minimum Score to Pass the APFT? The minimum score requirements for the Basic Training PFT differ from the requirements to graduate from AIT. To graduate from boot camp you need 150 points or higher or 50 points for each event on the DA Form 705. You need 180 points to graduate Advance Infantry Training or 60 points for each event. The higher you score - the better. Any scores around bare minimum are considered poor and could reflect badly on your record.